Jason was very eager to see how he stacked up against the other drivers now that he has some more skills in his gloves and the confidence to go with them. I managed to get us there just as the first practice of the day started, so my morning was a littl e crazier then usual as I filled out registration forms, unpacked, prepped, and pre-teched the kart, had to borrow some gas too(Thanks Jeff). After that the day was actually fairly relaxing, there were an unusual 5 rounds of practice in the morning, usually there are 3 maybe 4. 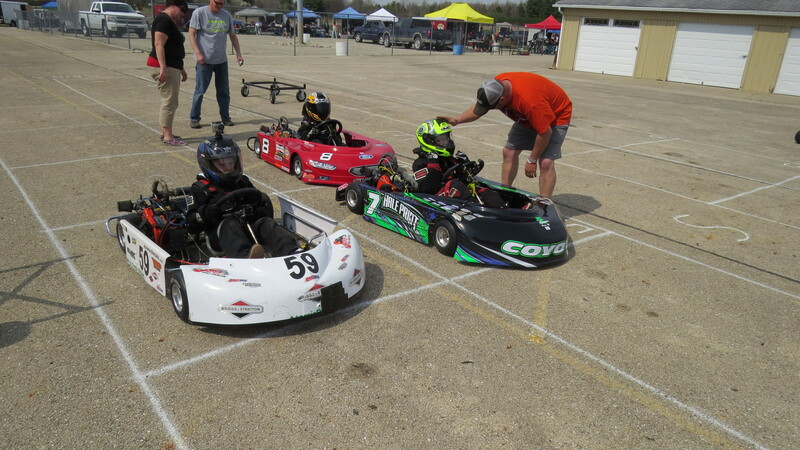 There were only 2 other LO206 sportsman karts, which was a little disappointing, Ashton, last years champion, who is super fast and clean, and Payton in his first sportsman race moving up from kid karts. Jason has finally settled into qualifying races. He no longer complains they are “not racing” for those three laps. This time he was able to qualify for the second position just a second behind Ashton, a far cry from last year where he was seconds behind the field. Payton qualified one second behind Jason in third place. The pre-feature was exciting with Jason just hanging onto the back of Ashton for all 8 laps. He was not quite able to get close enough to make any real attempts at passing but it was still impressive that he was able to stay right there with him, even setting the fastest lap of the race. Jason’s great pre-feature put in the second spot for the feature. By the start of the race the temperature had risen from the 50s and 60s into the low 70s. The warmer temperatures meant slightly lower horsepower. Low enough that Jason was no longer able to keep up with Ashton and was barely able to stay ahead of Payton. 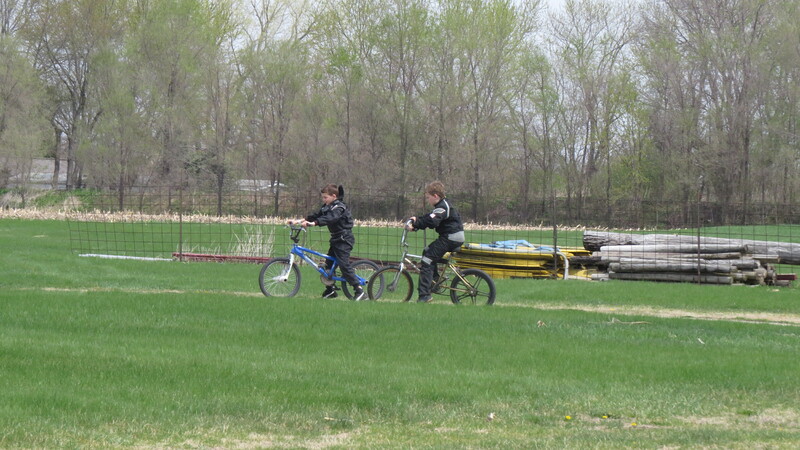 Though Payton gave a really great effort, Jason stayed just ahead of him for 14 long laps. Had I known that this could happen, I would have changed the gearing to bring the power back and let him keep up. Another lesson learned and added to the notebook. Sunday was not anywhere near as relaxed as Saturday. There had been predictions of rain all week and it was expected to arrive with vigor in the afternoon. The race marshal decided that there would be one practice and then racing straight through to the morning to get all the racing in before the afternoon rain. Jason went out for practice and got loose in turn two of the first lap and ended up stuck in the grass. The track crew was not allowed to help him get back on the track so he had to sit there and stew. Thankfully, he was able to go out and practice with the Yamaha rookies for some fast laps and was able to collect enough data to let me know that I need to drop the rear gear back down. This would let him run faster in the now cooler weather. He qualified 2nd and ran the whole pre-feature right behind Ashton. He continued making aggressive attempts at passing, often pulling alongside, but not in exactly the right place or time to make it stick. He finished the race 3 seconds back in the end, but still close. A really great race. After the checked flag, as he came around turn 3, the left rear wheel rolled away from the kart and through the grass. 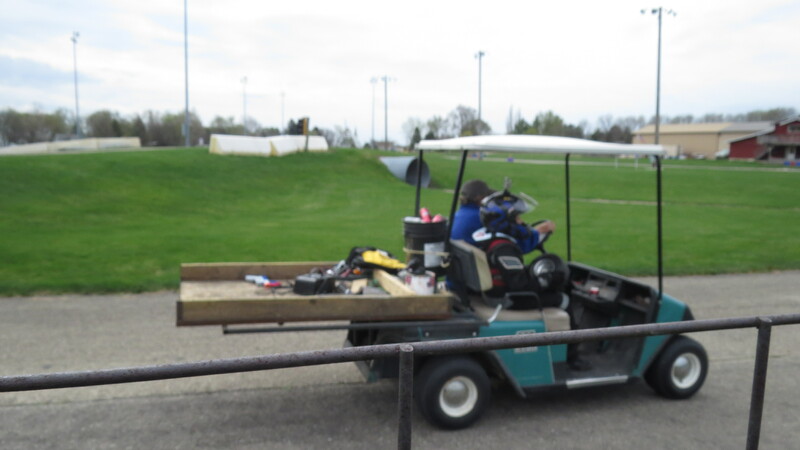 He and his kart slid to a stop in the grassy infield, and he hopped out and chased down his loose wheel. His kart was picked up by the track crew and he got a ride in the golf kart with this wheel in his lap. Somehow, that wheel and the right front had worked their way loose and had wallowed out the hole. Eventually the nuts came off and then the wheel. This necessitated a mad scramble to find spare wheels with tires and get them checked out by tech since we can’t change tires during the weekend without approval. 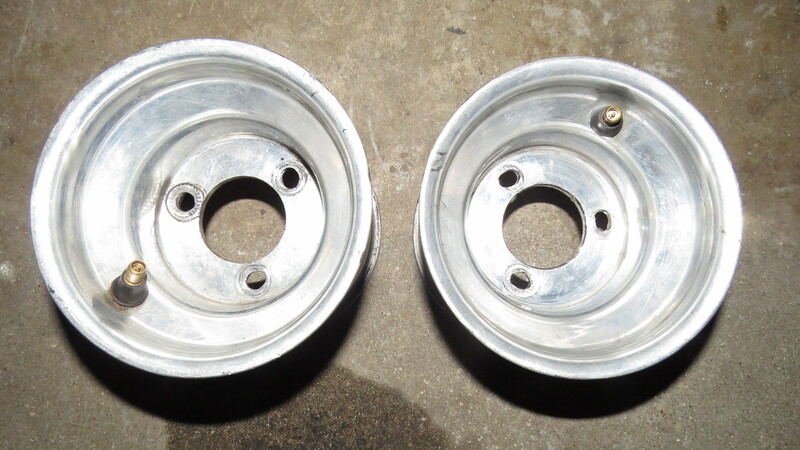 Thankfully, the Peschangs had a spare set that were ready to go and had some lug nuts as well. On top of the errant wheels, an aluminum body mount strut was broken. Some quick but frustrating work with a drill and that was was fixed too, well in time for the feature race. Regrettably, we don’t have video of the wheel chase, that would have made some great GoPro footage. Sunday’s feature was very similar to Saturday’s, Jason and the kart were in tune and running fast keeping, up with with the #7 of Ashton for about 7 laps. Then Jason started to slow down and drop back while still staying far ahead of Payton. In the end he finished in second place, a few seconds back. We were all happy with his performance and glad to put a much better end on this weekend than last weekend. Thanks to my parents who came to cheer Jason on. As always, Karen, who was there taking some great pictures. Yes, Katie, thank you too, even though you were “forced” to come. Special thanks goes to Peschang Racing and Faitz Racing for their help in our hour of need with parts and tools. Thank you to the crew of Mid-American Sprint Series and Concept Haulers Motor Speedway for putting on a great and safe show. Mona Peschang there is a space where you where. We miss you. The next race planned is the first official race at Badger Kart Club where we are expecting to race both LO206 and Animal classes.